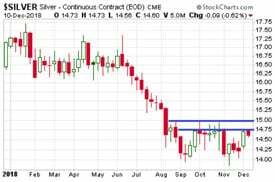 Home » Is the Buyer’s Market for Silver Coming to an End? Is the Buyer’s Market for Silver Coming to an End? Few markets are as depressed – and, as many analysts argue, suppressed – as silver. Prices for the white metal continue to languish in a low-level trading range amidst lackluster demand. The upshot for investors is that they can now obtain silver bullion at both a low spot price and a low premium above spot. How long this buyer’s market will is unknowable last. But given silver’s manic-depressive personality, prices could launch explosively higher at any time. The silver market now sits enticingly close to a major upside breakout. The weekly silver chart shows a potential double bottom forming at the September and November low points. For the moment anyway, value investors can continue to take advantage of fantastic bargains in the silver bullion space. One of the top attributes of silver is its versatility. It comes in a wide range of shapes and sizes, including some that are particularly well suited for barter and trade. Silver is often overshadowed by its pricier counterpart, gold, when it comes to discussions of sound money. Yes, gold is more likely to be held in reserve as a monetary metal for backing a currency. But silver is more likely to be exchanged by individuals in actual, everyday transactions. · A 90% silver dime is worth just over a dollar in terms of its intrinsic metal content. · A silver quarter, about $2.85. · A silver half dollar, $5.70. · A half ounce pure silver round, $9.00. · And a one ounce silver round, $16.60. Pre-1965 90% silver coins may command additional historical/scarcity premiums above their melt value in the future. You can obtain them now at regular bullion prices, giving you a free “call option” on rising premiums. Every silver investor should have some small denomination coins/rounds for barter and trade. Beyond that, those looking to allocate significant wealth to silver will find larger size products more cost effective and more convenient to store. Conventional one-ounce coins/rounds are a good place to start as they are widely recognized. Most privately minted rounds are just as pure (.999 silver) as more famous government minted coins such as silver American Eagles. The advantage to opting for products with no official coin status is they tend to carry lower premiums – thus giving you more metal for your dollar. Serious silver stackers should consider larger bullion bars, which tend to be the most cost-effective way of building wealth in silver. Silver bars are available in 1 oz, 5 oz, 10 oz, kilo, 100 oz, and 1,000 oz sizes. The 1,000 oz bars are generally not recommended except when holding in a Comex depository. These bulky bars are difficult to handle and ship, and, unless held in a Comex warehouse, may need to be assayed before selling. The largest bar most investors should consider owning is the 100 ouncer. It’s not too heavy to handle and can be easily sold back to dealers. The combination of low silver prices and low retail premiums on silver coins, bars, and rounds is a market condition that has only existed in the past 18 months. But both premiums and spot prices appear to be on the rise once again. Stefan Gleason is President of Money Metals Exchange, the national precious metals company named 2015 "Dealer of the Year" in the United States by an independent global ratings group. A graduate of the University of Florida, Gleason is a seasoned business leader, investor, political strategist, and grassroots activist. Gleason has frequently appeared on national television networks such as CNN, FoxNews, and CNBC, and his writings have appeared in hundreds of publications such as the Wall Street Journal, Detroit News, Washington Times, and National Review.